For the past several months, DreamHost has been working with the Department of Justice to comply with legal process, including a Search Warrant (PDF) seeking information about one of our customers’ websites. 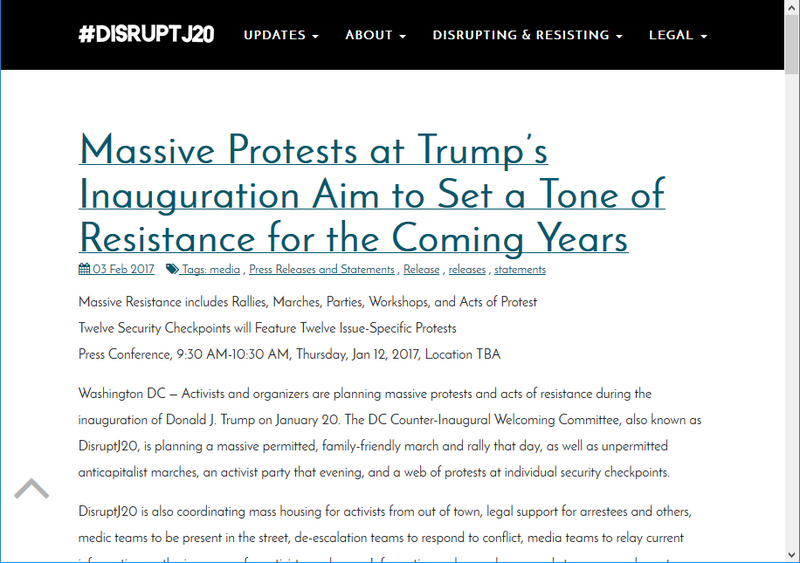 At the center of the requests is disruptj20.org, a website that organized participants of political protests against the current United States administration. While we have no insight into the affidavit for the search warrant (those records are sealed), the DOJ has recently asked DreamHost to provide all information available to us about this website, its owner, and, more importantly, its visitors. DreamHost, like many online service providers, is approached by law enforcement regularly to provide information about customers who may be the subject of criminal investigations. These types of requests are not uncommon; our legal department reviews and scrutinizes each request and, when necessary, rejects and challenges vague or faulty orders. You would be shocked to see just how many of these challenges we’re obligated to mount every year! Chris Ghazarian, our General Counsel, has taken issue with this particular search warrant for being a highly untargeted demand that chills free association and the right of free speech afforded by the Constitution. That information could be used to identify any individuals who used this site to exercise and express political speech protected under the Constitution’s First Amendment. That should be enough to set alarm bells off in anyone’s mind. This is, in our opinion, a strong example of investigatory overreach and a clear abuse of government authority. As we do in all such cases where the improper collection of data is concerned, we challenged the Department of Justice on its warrant and attempted to quash its demands for this information through reason, logic, and legal process. Instead of responding to our inquiries regarding the overbreadth of the warrant, the DOJ filed a motion (PDF) in the Washington, D.C. Superior Court, asking for an order to compel DreamHost to produce the records. Last Friday Mr. Ghazarian, with the help of his legal team and outside counsel, filed legal arguments in opposition (PDF) of the DOJ’s request for access to this trove of personally identifiable information. This motion is our latest salvo in what has become a months-long battle to protect the identities of thousands of unwitting internet users. Mr. Ghazarian will attend a court hearing on the matter on August 18 in Washington, D.C.
We’ve been working closely with the Electronic Frontier Foundation and their counsel throughout this process. They’ve been nothing but supportive and helpful throughout, and we’re honored to have them in our corner. While the EFF is not representing us in this case, they understand our arguments and have been lending professional support. The internet was founded — and continues to survive, in the main — on its democratizing ability to facilitate a free exchange of ideas. Internet users have a reasonable expectation that they will not get swept up in criminal investigations simply by exercising their right to political speech against the government. We intend to take whatever steps are necessary to support and shield these users from what is, in our view, a very unfocused search and an unlawful request for their personal information. Post Updated 8/14/17 9:00PM PST to clarify the EFF’s involvement.